On this day in 1930 Gregory Corso was born. He died in 2001 and is buried in the English Cemetery in Rome, in proximity to the Romantic poets Percy Bysshe Shelley and John Keats. Krim published the long poem “Spontaneous Requiem for the American Indian” in the anthology. I thought I would print a particularly relevant clip to our current political predicament in America. o requiems, Hathor off-far bespeaks Wakonda. . . .
On this date in 1919 Lawrence Ferlinghetti, poetic patriarch and premier promoter of Innovative and radical poets everywhere, was born in New York. His City Lights Bookstore in San Francisco has been the Mecca for everybody interested in poetry and insurgent literature since the 1950s and is still going strong. I have been publishing several posts early on in The Scene based on Seymour Krim’s 1960 anthology of the Beat Movement. Before each Beat writer that Krim featured he wrote a short profile. 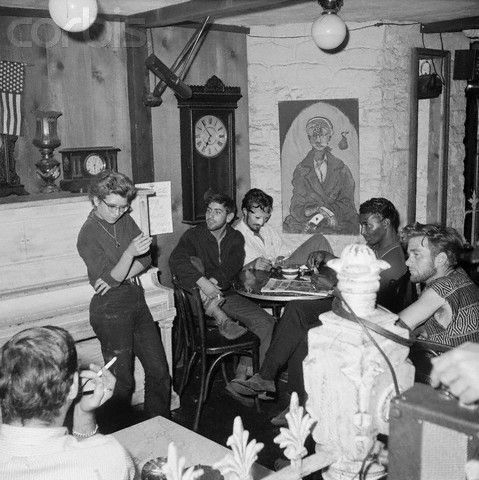 What’s so fascinating about Krim and his little book is that it was written and published when the Beatnik culture was dominating America’s 1950s. So he writes from the perspective of the moment and with the crazy Beatnik vernacular that often was fodder for cartoons, satire, and ultimately Hollywood movies. Follow The Scene and share widely on social media. Here is Jack Kerouac’s profile by Seymour Krim written right at the time Kerouac was becoming a national figure and the Beatnik craze was going strong.